Prior to participating in a blended-learning pilot, Angela Jones, a teacher at Bella Romero Academy in Greeley, Colorado, had already started putting a great deal of effort into personalizing learning for her students, despite limited access to learning software and devices at the time. In these early personalized classes, Jones led with 15 minutes of whole-group instruction and then gave her students differentiated worksheets that broke down tasks by skills and subskills for each proficiency level. Yet, as Bella Romero’s principal Jon Cooney would tell her, Jones found herself “hitting her head on the ceiling” without the boost from online content and devices to be able to truly personalize her students’ learning. When Education Elements partnered with Bella Romero for the 2015–16 school year, Jones and her cohort of elementary teachers launched blended learning with a uniform approach: a Station Rotation model using the online math curriculum Zearn, the online adaptive reading assessment i-Ready, and the online reading and writing curriculum tool Achieve3000. Jones welcomed the fact that the Station Rotation allowed her to track student progress in a way that she hadn’t been able to achieve with her personalized worksheets. Along with some of her colleagues, Jones established a three-station model in her math class: 40 minutes of online content, 20 minutes of independent or collaborative learning, and 20 minutes working with the teacher. Jones said that they landed on 40 minutes of online learning because it was the suggested allotment from Zearn and the teachers lacked experience to determine how much time students should spend on the program. Find examples of Station Rotation in schools like yours in the BLU directory. Jones facilitated two major model shifts last year among 4th-grade teachers. First off, they addressed the fixed-time aspect of the stations. “There is nothing magical about having a student on Zearn for 40 minutes a day,” Jones said. “This year, we’re comfortable enough with the [digital] tools to make changes, and we’re focusing on the students.” Some teachers still operate set rotation times, but when a student is struggling, the teacher pulls him or her away from the online station for tutoring. Other teachers assign small groups of students to targeted instruction, changing the groups daily, as needed. According to Jones, every student meets with the teacher at least every other day. In some cases, this occurs in small groups. Alternatively, other teachers provide flexible time during the rotations when students may pause from a task to ask the teacher one-off questions. In their own ways, all of the 4th-grade teachers are adapting the Station Rotation model to ensure that every student practices a concept until mastery before moving to the next unit of the online curriculum. Jones’s second major model update was helping some teachers create playlists, which guide students through one “mission”, or curriculum unit, for approximately two weeks. Jones said the playlists are not typically personalized at the elementary school level, so most students share the same set of tasks within the playlist. For a few students in each class who show clear gaps in their learning, however, teachers supplement and customize the playlists to include assignments with below-grade-level content. Meanwhile, students who master a mission ahead of schedule have the option to advance to the next mission or work on an extension project. 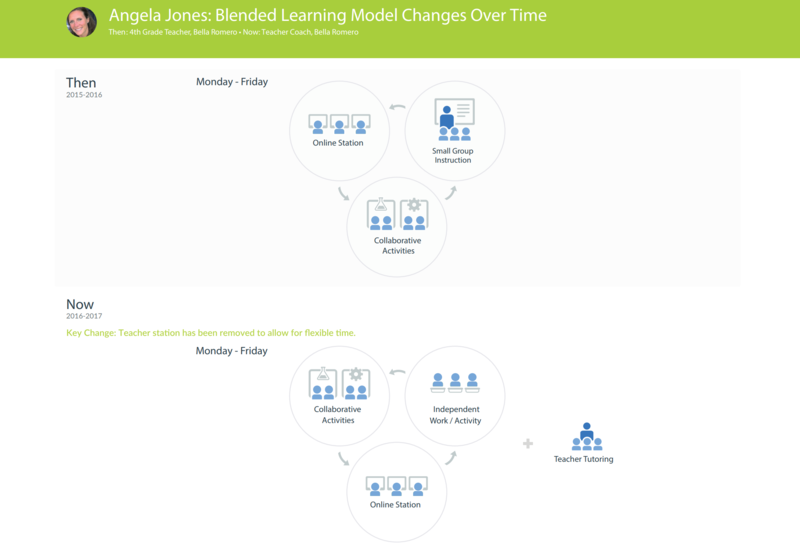 Jones aims to support teachers to build blended-learning models in the manner that works best for both the students and the teacher. She finds that as a result there is much greater diversity across teachers’ approaches to blended learning than when their cohort first launched the Station Rotation. “Even with really skilled teachers, their models are changing,” Jones observed. “It is almost even more flexible now to be able to say, ‘For this subject in this unit, I am using stations. While for this mission, I am using Flex.’” Some Bella Romero teachers moved from the Station Rotation to the Flex model, which is driven by playlists rather than fixed rotations. Others are finding ways to individualize within the structure of the Station Rotation. To read more teachers’ stories about customizing their blended model, see our latest case study, Blended (r)evolution: How 5 teachers are modifying the Station Rotation to fit students’ needs.